I'm going to start the socks for Purlescence soon. As a tease, here's the story I submitted to the competition. It sets the scene for the pattern, and gives clues to what it'll finally look like. Alice lay under a tree. It was a sunny afternoon, just an hour or so before dusk. A book of Very Hard Sums sat on her lap. She was supposed to be reading it, ready for an exam on Monday. Instead she stroked her cat, distracted by the softness of his fur. The cat, uncharacteristically considerate that Alice needed to finish her homework, gave her an accusing look and shuffled down to settle round her legs. She picked the book up again and tried to read. But she was in one of those dreamy moods, and sleepy with it. The lines of text started to blur, to intermingle, forming strange, shadowy shapes on the page. Like clouds in a summer sky. She looked down at her feet. They were warm and cosy, with the cat wrapped around the brand new stripy socks she had cast off only that morning (sock knitting being perfect exam procrastination). She tried to wake herself up by wiggling her toes. She pointed them back and forth like a ballerina, bending her ankle to arch her whole foot. The cat gave her a meaningful look, as if to say "stop shifting my bed, you annoying girl". She pulled a face at it back and went back to her maths homework. But the lines of text were still swimming, and Alice's eyes were starting to drop. She yawned. But it was too late. She was too tired, too warm, and too comfortable and she started to fall. Falling asleep. Falling asleep. Falling. Falling down. Falling down? Falling down a tunnel? She landed. Thump. And for no reason she had time to consider here, started chasing a rabbit. The rabbit disappeared and she encountered a very Mad Hatter and all sorts of strange card games. She thought she might have to play chess, untangle a sheep’s lacework, talk to plants and discuss literary theory with Humpty Dumpty, but it turned out that would come another day. And then there was that cat. A very odd cat. An odd cat that grinned broadly and kept disappearing and re-appearing. Occasionally giving her meaningful stares, to which she replied by pulling a face. It's all very confusing. And it's all so very stripy. The cat was a tabby. The rabbit wore a striped waistcoat. As did the Hatter and his friend the dormouse. Even the tunnel has forms of stripes, with all its stalagmites. Exhausted and confused, Alice awoke. Back at her original tree, with her book of Very Hard Sums still sitting unread on her lap. She realised all those rabbits and card-games were merely a dream. She wiggled her feet again, pointing her toes back and forth as before, gradually building herself up to move and get home for dinner. She looked around for her cat. He was no where to be seen. Disappeared again, Alice thinks. That bleeding cat, he's probably chasing that tabby-point Siamese from next door. She points her toes again, looking down to admire her new stripy socks once more. But something had changed. There's an odd shadowy shape running down the side of her ankle and onto the top of her foot. She points her toes tightly, arching her foot forward and the shadow becomes more pronounced. It's a cat. A cat silhouette on her socks. If you'd not already guessed, they're illusion socks, like these. 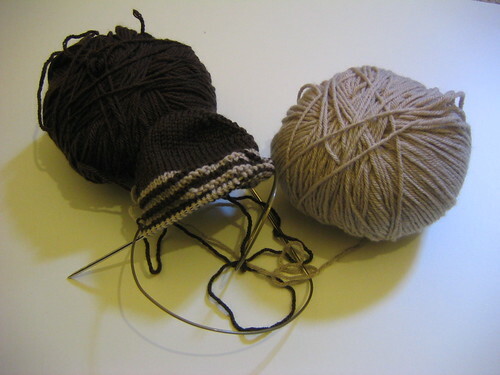 It'll be done in cashsoft 4ply, in shades of brown (tabby cat style). 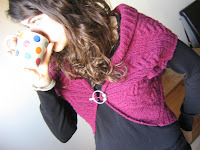 First, thanks for all the lovely comments and emails about my design in knitty. At least one blogger had started it already. 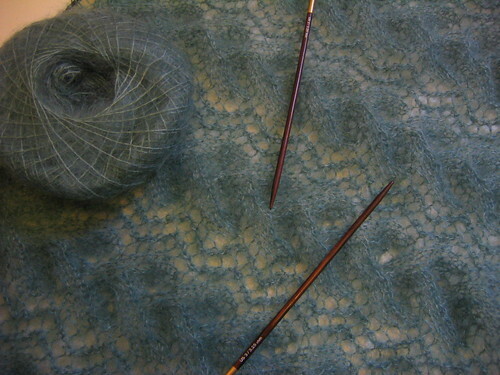 But on to the current knitting. One monkey-inspired legwarmer down, one to go. After truncated Pom's and Herrings, these are the third set of Cookie's socks I've legwarmer-ed. In many ways this is plain silly, Cookie always produces such good sock patterns. Designs that work well running from ankle to foot; neatly matched heels and toes. Some socks are just conveniently sized stitch patterns, but nothing so prosaic for Cookie. If anyone is in any doubt about her sock-genius, check out her new store. But I needed legwarmers, they at least scratch the itch I had to knit these patterns without actually producing socks I don't need. The yarn is Lorna's Laces shepherd sock in the desert flower colourway, which I'd been coveting for over a year and finally caved into buying when my grant finally came through. 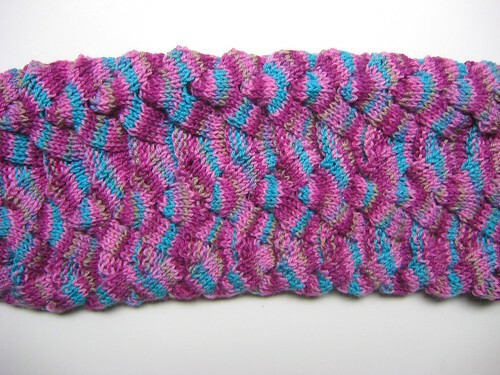 It's just the stitch pattern from monkey, worked on 2.5mm's and over an extra 16sts. In other news, I won the januray Storyteller's design competition! The question was 'what would Alice knit?' so naturally I had to enter. I concluded that the storyworld's Alice would, of course, knit socks. None of this messing about with legwarmers for her. She'd knit stripy socks. Stripy, illusion-knit socks. With cats on. Part of the prize is yarn to make the design up with, and I'll be writing up the pattern up for Robynn, blogging as I go, so all will be revealed soon. 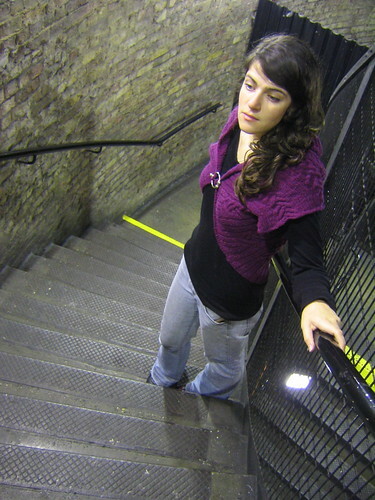 New Knitty, with my Ester pattern is up. 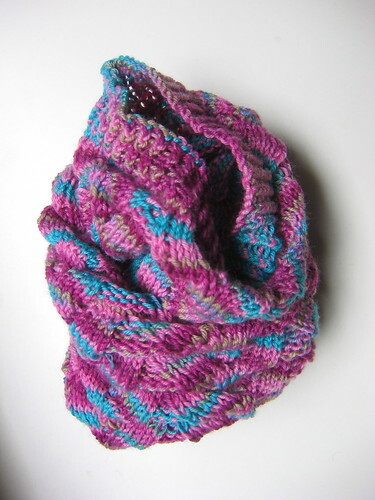 It was named after a very dear friend who died this summer, and in her memory really should be knit in purple. Click on the photo to go to where there are a few more photos. FO! An FO with squirrels. 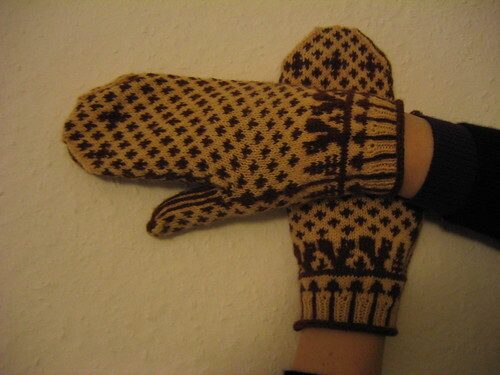 Pattern: Elli's great squirrely mittens (pdf). Needles: 2mm addi turbo circs, 80cm - magic looping. Yarn: opal uni (less than half a ball) for the vanilla-coloured MC, and almost a ball of knitpicks essential for the chocolately CC. 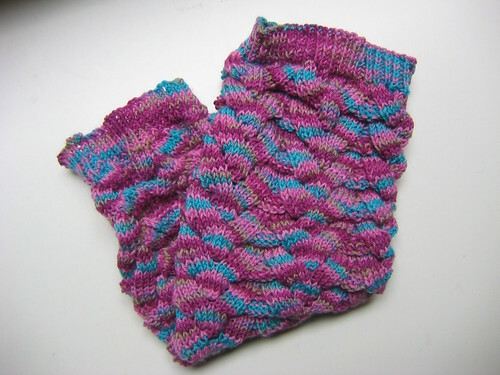 Mods: I changed the cuff, with a icord cast on, then a two-colour rib, al la Eunny's Anemoi mittens. My boyfriend thought this made the trees at the bottom look like mushrooms. He even went as far as to suggest they were magic mushrooms and the squirrels were tripping out, not dancing. But I know they are trees, my squirrels are much too well behaved for that. Notes: I love them, lots and I'm really pleased to have got them done before the weather got too warm. Although, next time I do mittens I'm definately going to use the Anemoi-style increased thumb gusset, because the set-in one stretches the fabric a bit.